We make much of the jewelry we offer but we also feature jewelry from Artists and Designers that we know. 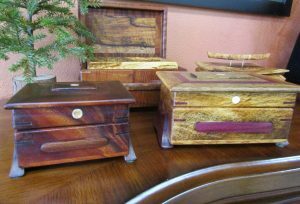 We also have other art forms in our store from Artists that we like, like these Wooden Jewelry Boxes made of repurposed Exotic Wood. Many of the boxes feature repurposed Mango and Koa wood from Hawaii and Juniper from Oregon, with deer horn antler slices used as accents. This artist finds the deer horns on his property. Most deer grow and shed their horns every year. We hope you enjoy these jewelry boxes as much as you enjoy our jewelry. Thanks for sharing the amazing information the wooden jewelry boxes are very durable and good looking.